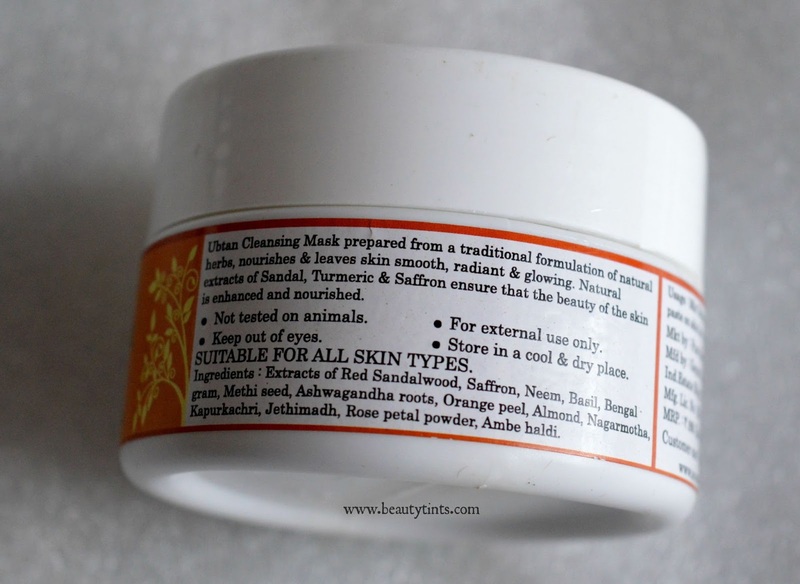 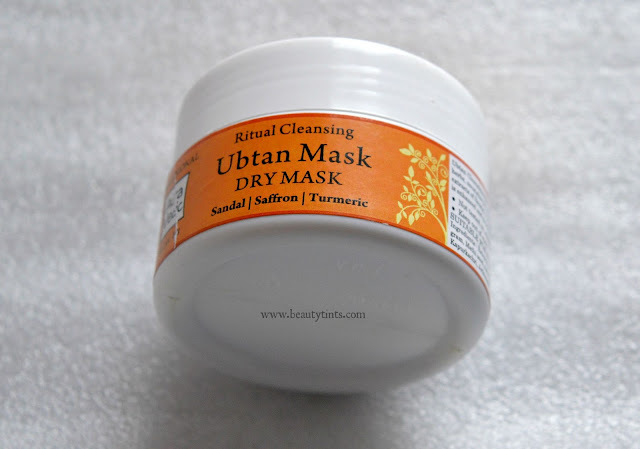 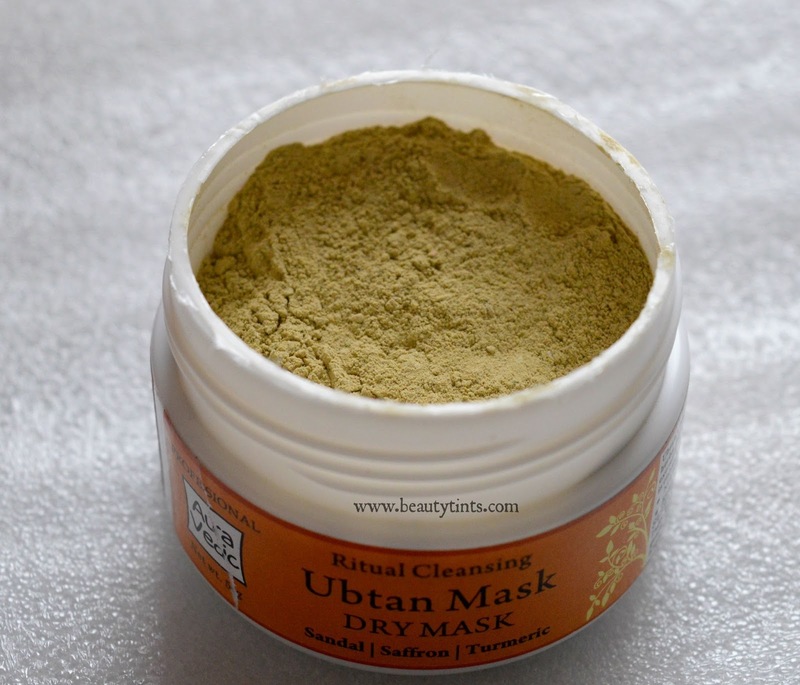 Sriz Beauty Blog: Auravedic Ritual Cleansing Ubtan Dry Mask Review!!! 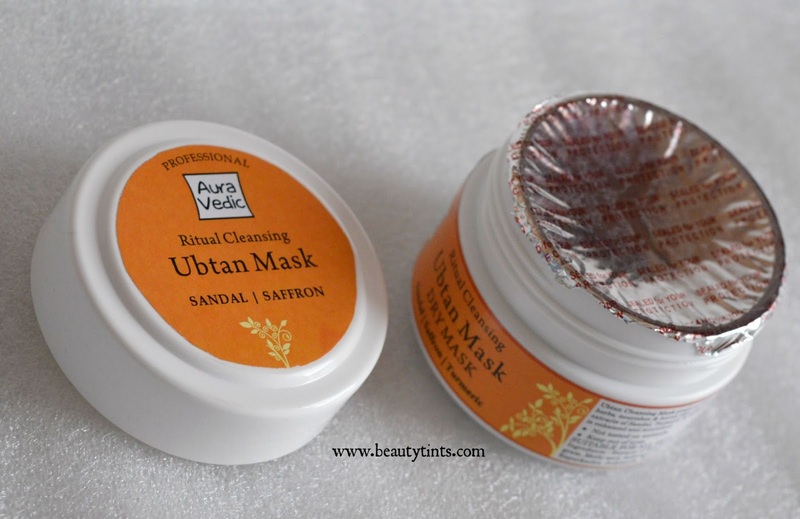 Auravedic Ritual Cleansing Ubtan Dry Mask Review!!! 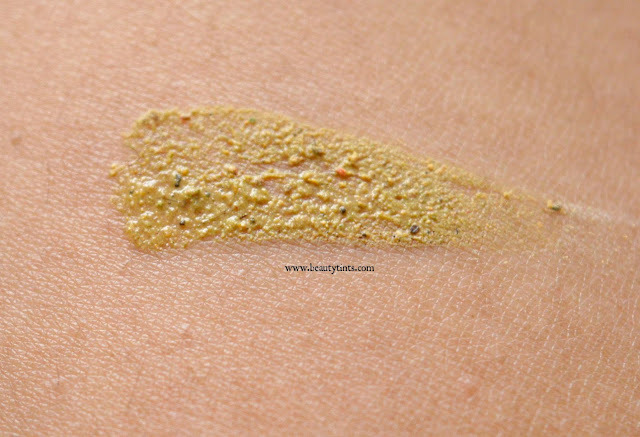 Few months back I have reviewed a wonderful Ritual Skin Lightening Face pack from AuraVedic and now as a part of Face Pack series,today I am reviewing one more face pack from Auravedic, which is their Ritual Cleansing Ubtan Dry Mask which is enriched with the goodness of Sandal and Saffron. 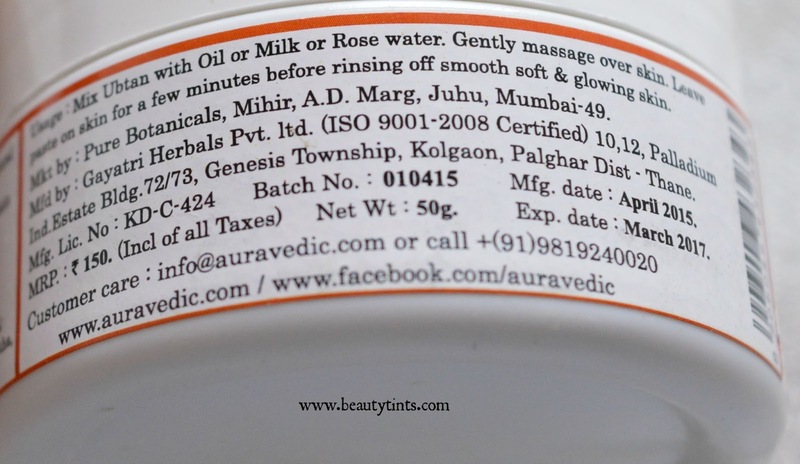 Packaging : It comes in a cute tub packaging with a bright yellow and orange labels over it with a screw cap. 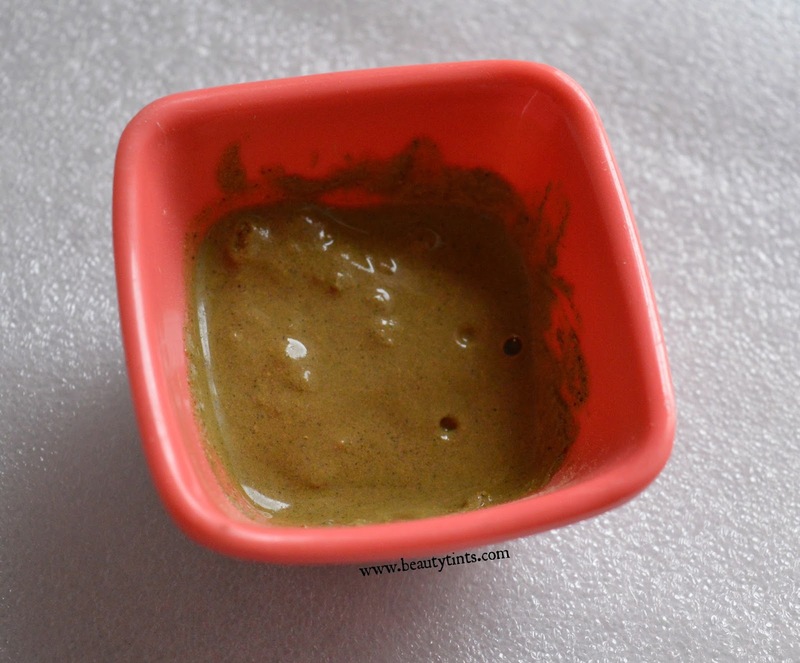 Color and Texture : This is a yellowish green colored powder. Ritual Cleansing Ubtan Mask with Sandal Saffron : Ubtan Cleansing Mask prepared from a traditional formulation of natural herbs, nourishes & leaves skin smooth, radiant & glowing. 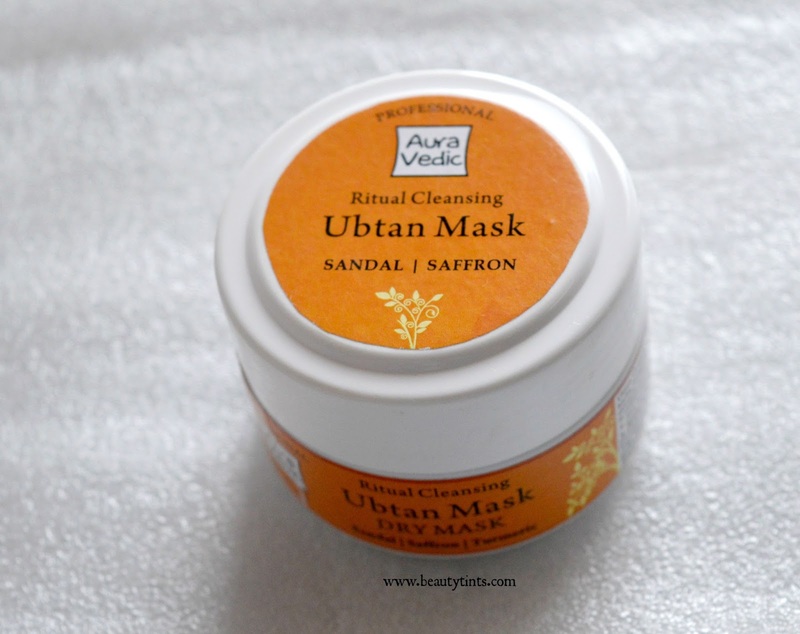 Natural extracts of Sandal, Turmeric & Saffron ensure that the beauty of the skin is enhanced and nourished. Ingredients :Extracts of Red Sandalwood, Saffron, Neem, Basil, Bengal gram, Methi seed, Ashwagandha roots, Orange peel, Almond, Nagarmotha, Kapurkachri, Jethimadh, Rose petal powder, Ambe haldi. Directions : Mix ubtan with Oil or milk or rose water.Gently massage over skin,leave on the skin for few minutes and then rinse. Availability : Available in few online stores.You can buy it from here,here and here. 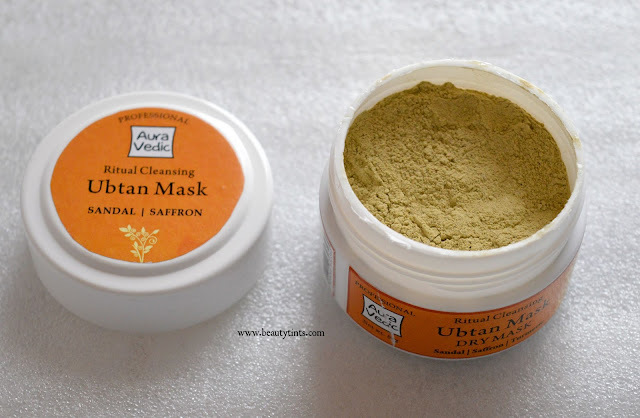 My View On the Product : This Ritual Cleansing ubtan mask is in powder form and has a mixed herbal fragrance with a dominant chickpea flour fragrance.This powder has to be mixed with either oil or rose water or milk.I prefer to mix it with rose water as I have oily and acne prone skin and those with dry skin may try this with milk or oil.It takes 10-15 mins to get dried completely and gets rinsed off easily with out much effort.The powder is finely grounded with very fine exfoliating particles.It is very gentle and doesn't irritate the skin.It gives a good cleansing and exfoliation to the skin,making it squeaky clean and smooth.It removes the excess oil and sebum well from the skin,with out drying out the skin.This Ubtan is enriched with the goodness of herbal ingredients like Extracts of Red Sandalwood, Saffron, Neem, Basil, Bengal gram, Methi seed, Ashwagandha roots, Orange peel, Almond, Nagarmotha, Kapurkachri, Jethimadh, Rose petal powder, Ambe haldi.This Ubta pack is completely natural and chemical free.On continuous usage of this ubtan,the skin becomes visibly soft and radiant.It also removes tan and discoloration to some extent.It is very affordable and easily available too. 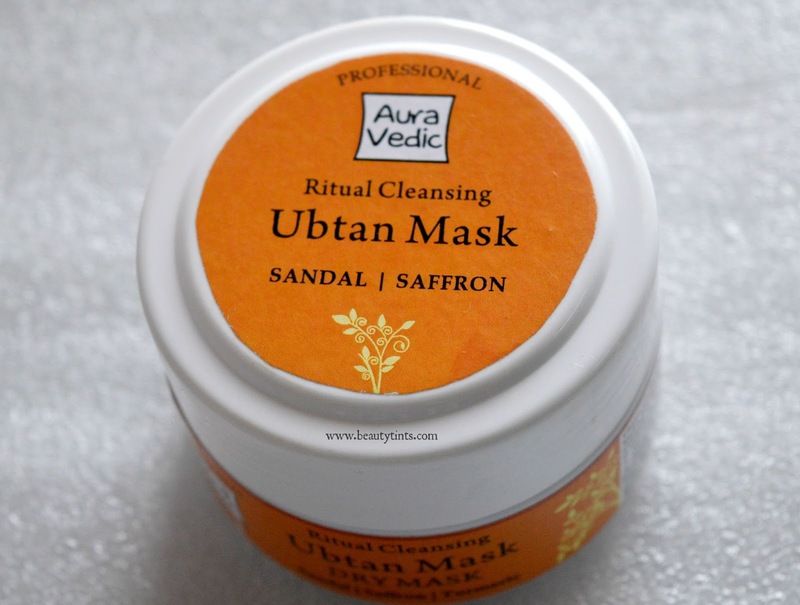 Final Conclusion about Auravedic Ritual Cleansing Ubtan Dry Mask : Those who love pampering their skin with natural ubtan,which can help in making the skin smooth and radiant should not miss this!!! *PR Sample : However it didn't effect my opinion.